Any good workout will make you sweat, but summer workouts generally make people sweat more than ever. This means that there’s a bunch of people losing electrolytes at a higher rate than normal. We figured there’s no better time than late July to talk about what happens when your body loses electrolytes. Electrolytes are found in bodily fluids, including your sweat. They earn their name by producing charged ions when dissolved in water. These ions allow your nerves to communicate, which, in turn, helps your body function correctly. Without the correct balance of electrolytes, Electrolyte imbalances come in different forms and can be caused by anything from hormonal imbalances to sickness to chemotherapy. One of the most common types of imbalance is caused by sweating combined with an electrolyte-deficient diet. Are You Low on Electrolytes and Just Living With It? When you’re low on electrolytes, it can be hard to ignore. 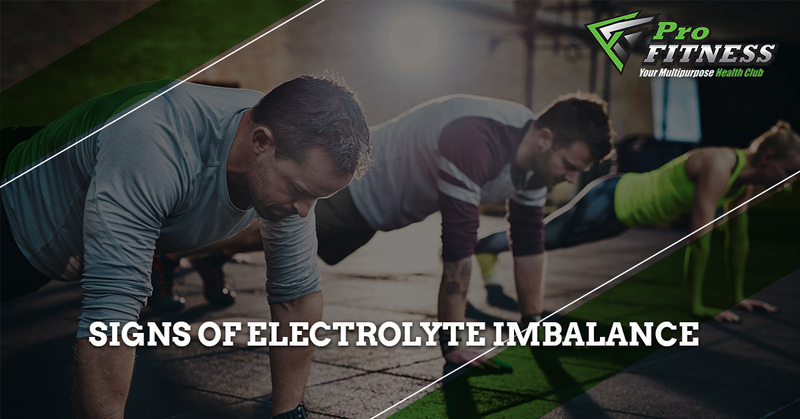 However, many people fail to make the connection between electrolytes and feeling low. 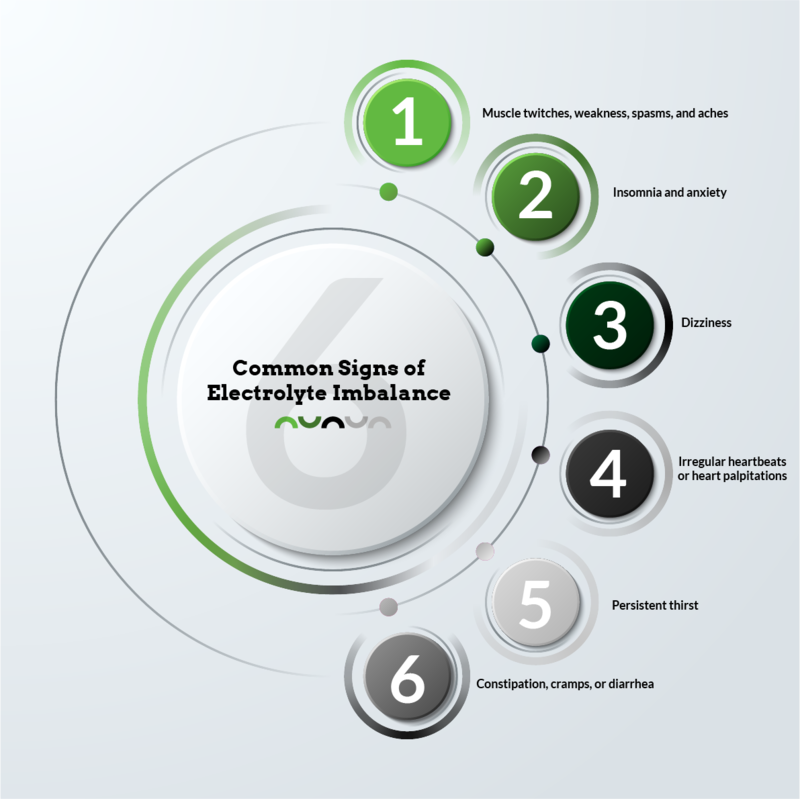 The following is a list of common signs of an electrolyte imbalance. Do any of the symptoms look familiar? When you work out, sweat hard, and get dehydrated, your magnesium and potassium levels drop very quickly. If the electrolytes aren’t replaced, spasms, cramps, and weakness are the first signs to show up. Constipation can follow. It’s important to do whatever is necessary to make sure you get your electrolytes back. If you’re struggling with muscle spasms or an overly fast heartbeat, it can be very difficult to fall asleep. If you’re always tired but unable to get to sleep, you may be dealing with low levels of magnesium and high levels of potassium. When your sodium levels get too high, you can end up struggling with weakness and dizziness. Excessively high levels of potassium and calcium can interfere with the nerves and transmission pathways to the heart, creating rapid rhythms, weakness, tingling, and numbness. Feeling like you can never drink enough water is a clear sign that you need more potassium and magnesium, not just more water. You can’t go to the bathroom if the muscles of your digestive system don’t contract correctly. Without the correct levels of the major electrolytes to keep the muscles doing their jobs correctly, you can end up with constipation, diarrhea, and cramping. If the problem isn’t solved, you may also experience disorientation, headaches, and respiratory issues. If you’ve worked out hard in the past few days and any of the above symptoms are familiar, it’s probably time to work on rebalancing your electrolyte levels. On the other hand, if you experience the symptoms on a chronic basis, you should have your doctor test your electrolyte levels. Understanding just what is going on will allow you to make important changes. Stay tuned for our next blog, where we’ll discuss ways you can support your electrolyte balance! Summer is a great time to work out, especially if you can do so in a fantastic fitness center like ours in Warwick. 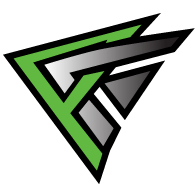 Learn more about our classes, personal training, and more today!